We've spoken a lot about the benefit of the B-vitamin inositol for women with PCOS. For example, we've said that women with polycystic ovary syndrome taking supplemental inositol have a shorter time to first ovulation, and had a higher frequency of ovulation. The effect on ovarian follicles appeared to be rapid, starting in the first week of treatment. In addition, studies have shown those taking inositol lost weight while the placebo groups gained weight. So we know this supplement helps women who are premenopausal. But what about older women who have a history of PCOS? Could inositol help them? It seems that almost all the research is focused on younger women, of reproductive age. However, we discovered a recently released study from the University of Messina in Italy indicating that inositol may be helpful for women who have reached menopause. This was a study of 80 postmenopausal women who had metabolic syndrome. Some took 2 grams of inositol daily for six months. Others took a placebo. At the end of six months, the women taking inositol had significantly reduced blood pressure, insulin resistance and cholesterol. The drop in insulin resistance was a dramatic 75%. Metabolic syndrome is similar to polycystic ovary syndrome in many respects. For example, insulin resistance is typically common in both disorders, and is a primary cause of both disorders. Therefore, if inositol helps postmenopausal women with metabolic syndrome, it is likely to also be helpful for postmenopausal women with a history of PCOS. We also came across a more recent study from the University of Messina in Italy of eighty postmenopausal women with metabolic syndrome. Forty were given 2 grams of myo-inositol per day for one year while the other forty took a placebo. All were placed on a calorie-restricted diet. Amazingly, eight of the women taking inositol no longer had metabolic syndrome. Only one in the placebo group was free of metabolic syndrome. This study suggests that taking inositol supplementation over the long term is very helpful for both PCOS and metabolic syndrome. 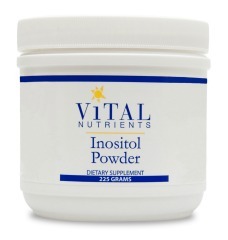 You can find a high-quality, potency-verified powdered inositol here. Santamaria A et al. One-year effects of myo-inositol supplementation in postmenopausal women with metabolic syndrome. Climacteric. 2012 Oct;15(5):490-5.